Refrigerators, freezers and combined fridge freezers all use the same format of energy label. The current EU Energy Label for refrigeration equipment ranges from A+++ (most efficient) to D (least efficient) as shown below. 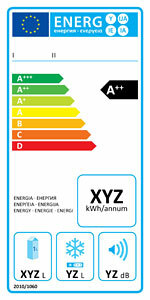 From 1st July 2012, any new models put on the market need to comply with an energy rating of the top three label classes, A+, A++ or A+++. For the most efficient products, look for the darkest green band. Our Topten ranking is based on the Energy Efficiency Index and shows the differentiations within the top label class(es). The label also displays the amount of energy that the product uses over a year (in kWh). The lower this number is, the less energy the product uses. The two volume icons at the bottom show the capacity of the refrigeration compartment on the left, and freezer compartments, in the middle. Replacing an appliance such as fridge-freezer can mean a significant financial outlay and takes careful consideration. Knowing exactly when to replace an appliance, especially one that is still working, can be difficult. 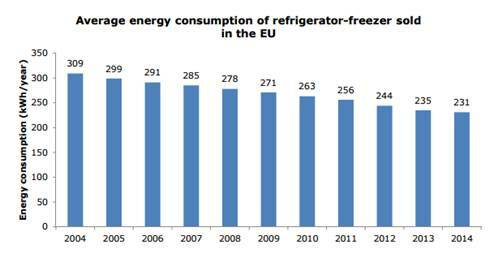 Generally, older fridge-freezers will consume more energy than a new highly energy-efficient one since EU regulations setting limits to energy use have come into effect. The new EU Energy Label shows the estimated annual electricity use of appliances, so you can easily find out how your fridge-freezers fares compared to a new model before committing to a purchase. Make sure air can circulate around the back of your fridge and freezer. Try not to put the fridge or freezer next to a heat source such as a cooker or radiator, or in direct sunlight as this will make the fridge work harder to stay cool and use more energy. Conversely, do not keep your fridge-freezer in a cold environment such as an unheated garage in winter – the low ambient temperature will signal to the appliance that it doesn’t need cooling and you may find your frozen foods defrosting. Check for gaps in door seals that could let warm air in. Place a piece of paper in the door. If you can easily remove the paper with the door closed, it is not sealed properly and will be letting warm air into the fridge, making your appliance work harder to stay cool. Regularly clean any dust from the back of the fridge or freezer – accumulated dust increases energy consumption. Make sure your fridge and freezer are set to the right temperature – below 5°C for fridges and at 18°C for freezers. The temperature of your fridge affects how long food lasts, so this helps keep your food at its best and ensures energy is not being used to keep the appliance running at too low a temperature. Use a fridge thermometer to check that your fridge or freezer is at the correct temperature. Check the manufacturer’s instructions for which part of the fridge should be the coldest – this is where you should position the thermometer. Ensure that the fridge temperature has settled down by leaving the thermometer in the fridge for several hours or overnight before taking a reading. Do not store liquids in open containers as this will increase humidity in the fridge and cause condensation to form. This will impact on the energy used to keep the fridge cool. Ensure warm foods are cooled down before placing them in the fridge or freezer so as not to raise the temperature inside the fridge. Defrosting foods in the fridge overnight will help keep your appliance cool. Do not fill the appliance with too much food so as to allow the air to circulate freely. If circulation is impeded, the compressor will work continuously. Don't keep the fridge or freezer door open for longer than necessary and try to avoid opening it too frequently. This will prevent the inside of the fridge-freezer from warming up and causing increased energy consumption. Fast freeze: This is particularly handy if you're freezing fresh food. By freezing more quickly, a fast-freeze setting lets the food retain more of its nutrients. And for many types of food – bread, for example – it stops the texture from changing too much. If your fridge freezer doesn't have a fast freeze switch, you can just turn down the thermostat for a while. Remember to turn it up again, though, or you'll be wasting a lot of energy. Frost free: This feature is designed to prevent frost from forming by circulating cold air continuously and collecting humidity from the fridge compartment. If you buy a frost free freezer, don't fill it up to the hilt as air needs to circulate to keep the frost at bay. It's also worth noting that if food isn't carefully wrapped, it can become drier than it would in a conventional freezer. Holiday setting: This is for when you're away from home for a few days or weeks. Press the button and, while you're away, the fridge will switch off and the freezer compartment set to the lowest (coldest) temperature. On some models this lowers the energy used when you're not there and saves money. The only catch is you'll need to empty the fridge first or your food will spoil, so plan your meals the week ahead to enable you to switch this on without wasting food. Most fridges have different temperature zones. An exception to this are fridges or fridge-freezers with a Dynamic Cooling function and if this is activated, the air is moved around the fridge cabinet and keeps all areas at the selected temperature, ideally 4°C. In this case you can store your food in any part of the fridge. If your fridge or fridge-freezer does not have Dynamic Cooling, positioning your food in your refrigerator is the key to saving energy and preventing food waste. The top of the fridge has an average temperature of 7°C, ideal for butters and cheeses. The middle of the fridge maintains the optimum temperature of 4-5°C. Fresh fish, cooked meats and dairy products, like soft cheese, cream and yoghurts are best stored in this area. The lower levels maintain a temperature of about 3°C and are the best place for raw meats and chilled ready meals. The salad drawers have a higher temperature of 8 to 10°C for the storage of fruits and vegetables. To lengthen the storage life of your fruit and veg, keep them separate, as these items give off toxins that can cause other items to deteriorate when stored together. Check what you have in the fridge and freezer before you go shopping. Wasted food is a big contributor towards carbon dioxide emissions and there is no point chilling food only for it to be thrown away! Use leftovers within 2 days and reheat thoroughly. Check the date labels on your pre-packed food to ensure you use them before they spoil. Don’t eat foods past their ‘use by’ date even if they look and smell fine. Check the storage instructions to ensure you are storing your food to keep it at its best, for example, eggs should be stored in their box in the fridge. Most fruit will last longer if stored in the fridge. Bread will stale quicker if stored in the fridge.